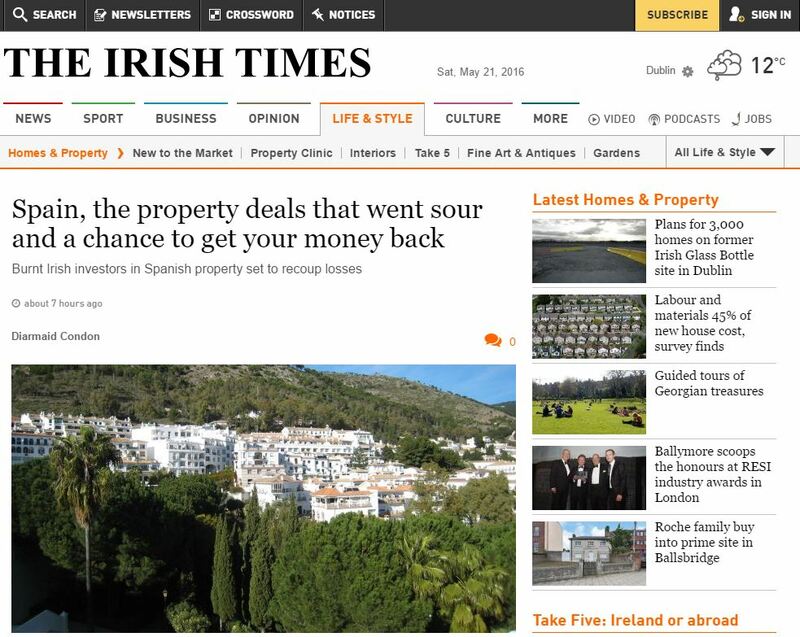 Firstly, many thanks to so many of you for reading the Irish Times Spanish property deposit reclaim article which appeared in the Saturday May 21st ‘Home and Design’ section of the paper. It is also available online at the IrishTimes.com website. Irish buyers of properties in Spain between 1995 and 2008 stand to benefit from a new ruling compelling financial institutions there to refund deposits placed with them for property purchases. This is actually incorrect. Those of you who have read further into the piece will see that at the bottom there is a section outlining the requirements for a Spanish property deposit refund. Here it correctly states that there is a 15 year statute of limitations on this reclaim process. This means that, at time of writing this piece on May 21st 2016, those who issued their first payment to the bank before June 2001 will not be in a position to apply for a refund. Conversely, those who put deposits on property from that time up to a change in the applicable law in Spain at the beginning of 2016 can still benefit from the reclaim process. There has not been a lot of good PR coming out of the Spanish property industry in recent years. Late last year news that property owners in Spain intending to rent out their properties had to meet stringent new criteria – and pay for the privilege – was the last in a long line of PR disasters. There is, however, some good news to report. Following separate EU and Spanish legal rulings over the past year the Spanish government and its financial institutions are being forced to repay millions of euro to property investors and inheritors both at home and overseas. During the period from 1995 to 2008 the Irish were among the most active purchasers of property in coastal Spain, so there will be significant interest in both cases. You can see that parts of it taken out of context could lead to a misleading conclusion, which is always a problem in legal circles. The deposit needs to have been paid not more than 15 years before the date of lodging the claim, due to the Spanish statute of limitations. Copy of the transfer of the deposit payment to the developer’s financial institution (bank or caja) – take particular note of the date of this transfer, as it is the date which will govern whether your claim can be processed or not.